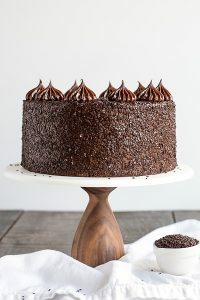 A chocolate layer cake recipe with dense, moist chocolate cake, silky chocolate truffle frosting and chocolate flakes. Place chopped chocolate into a large heatproof bowl. In a medium saucepan, combine heavy cream and butter. Cook on med-high, stirring often, until just simmering. Pour hot cream over chopped chocolate and cover bowl with plastic wrap. Let sit 5 minutes. Stir gently until completely smooth. Preheat oven to 350F. Grease two 8″ cake rounds, dust with cocoa powder and line bottoms with parchment. Add wet ingredients to dry and mix on medium for 2 to 3 minutes. Batter will be very thin. Pour batter evenly into prepared pans. Bake for approximately 30 minutes or until a toothpick inserted into the center comes out mostly clean. Once cooled, cut each layer in half horizontally, if desired. Place one layer of cake onto a cake stand or serving plate. Top with a thin layer of chocolate frosting (approximately 2/3 cup). Spread evenly. Repeat with remaining layers of cake and frosting. Crumb coat the cake. Chill for 30 minutes. Frost the cake and smooth the sides and top, reserving a small amount of chocolate frosting for the top decorations, if desired. Place cake back in the fridge for 20 minutes to set. Place a bowl upside-down on a baking sheet. Place cake on inverted bowl so that the sides hang over. Gently press chocolate flakes (or chocolate sprinkles) into the sides and top. Pipe dollops of reserved chocolate frosting on top using a large open star tip, like a Wilton 6B, if desired. Plan to make the chocolate frosting one day in advance. You can force the chocolate frosting to thicken quicker by placing the frosting in the fridge, but be sure to stir often.